jeffsbuzz: The wandering storyteller comes of age. The wandering storyteller comes of age. Jesse told us of a (fictional) wandering story-teller  who moved from village to village in “Old England” securing food and a bed for the night by telling stories of knights, dragons, evil barons and damsels in distress. This storyteller was very good at his trade, being eagerly welcomed by the villagers and always earning some coins as well as a very comfortable bed and great food, so what was his secret? The storyteller was clever; he would watch his audience closely while telling his story. If they liked the evil baron he would embellish the character, if they found the knight too chivalrous he would add some flaws. Depending on the reaction of his audience, he could vary the character of the damsel, from being a peasant’s daughter to a princess in disguise, perhaps hiding from her evil father and if they found her too weak, he could give her a surprising strength. All the time the narrative was being varied, as the story progressed, so that the audience remained interested, engaged and amused. Of course Jesse was making a point about the way storytelling in todays world could be enhanced, by allowing the audience to interact with the story, as it progressed. This was something I found particularly interesting having, at the time, a research team working on technologies to allow an audience to participate in on-line and broadcast stories. As early as 1998 researchers were working with the BBC, Sony and the UK’s Channel 4 on live trials. (See “Taking living worlds into people's living rooms” ). The recall of the event in Dublin and research of almost two decades ago was triggered while I was watching the latest BBC click programme on the 4th of March 2017  from the Mobile World Congress in Barcelona , where they explained that they were trying to broadcast some elements of the programme live in 360-degree video . They were building on their experience of producing a 360-degree video of the Large Hadron Collider, 10th of March 2016 , and a complete BBC click programme filmed in 360, 11th of March 2016 . To view this 360-degree video you will need a compatible browser, currently Google Chrome, Firefox or Opera. 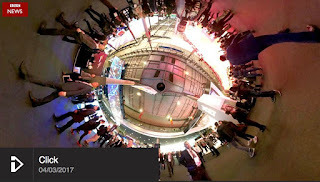 But why did these examples of 360-degree video remind me of audience participation in story telling? This 360-degree video technology , now available and easy to interact with, allows users to each have a unique and personal experience of the “story” unfolding before them. This is well illustrated by the film below, which is a 360-degree video taken in the cockpit of an aircraft as it journeys from Geneva to Zurich . When this video is viewed in a suitable web browser  the user can, while the video is playing, explore the flight deck of the aircraft. For example you can look up at the seat belt and no-smoking switches and down at the centre console and engine throttle controls. When a member of the aircrew enters the cockpit mid-flight, you are able to look at the rear of the cabin and see her talking to the crew. Looking to the left and right you are able to see the captain and first officer operating the aircraft “fly-by-wire” controls. Although you cannot alter the main narrative thread, which is the flight from Geneva to Zurich, you can have a completely personalised experience of the video images, which will almost certainly be different every time you watch it. Also the degree of interaction required is relatively small (moving a mouse), so this falls somewhere between a lean forward and lean back experience , which for many people, not comfortable with “computer gaming”, is important. This technology, although already relatively mature, continues to develop quickly. Early issues with the quality of the video will almost certainly be solved in the coming months, as will the stitching together of the various views. We are experiencing a shift in the way video content is able to be produced and viewed in the home, with HD, UHD, 3D and 360. The technology to view all of these simply and easily through a single device in the home still has a little way to go, as has the ubiquity of high speed network access. But as technologies and tools develop we should be able to experience and interact with content in new ways which are both pleasing and unique. NB: For maximum impact the 360-degree videos should be viewed full screen, when played there is a square symbol on the bottom right of the video which activates this mode. You should also allow a few seconds for the video quality to stabilise/improve. At times of high traffic viewing the videos directly on YouTube may enable better results, the first CERN video can be seen HERE, the second Aircraft video HERE.